I feel like I spent the whole week in front of the stove! Not a lunch, not a dinner with friends all week! I did a heck of a lot of cooking and grocery shopping and cooking and more grocery shopping, though. Eesh. Finally went for one of my walks with Zeke – sans camera (!). It had been too long as the heat and humidity have been too high for both of us. 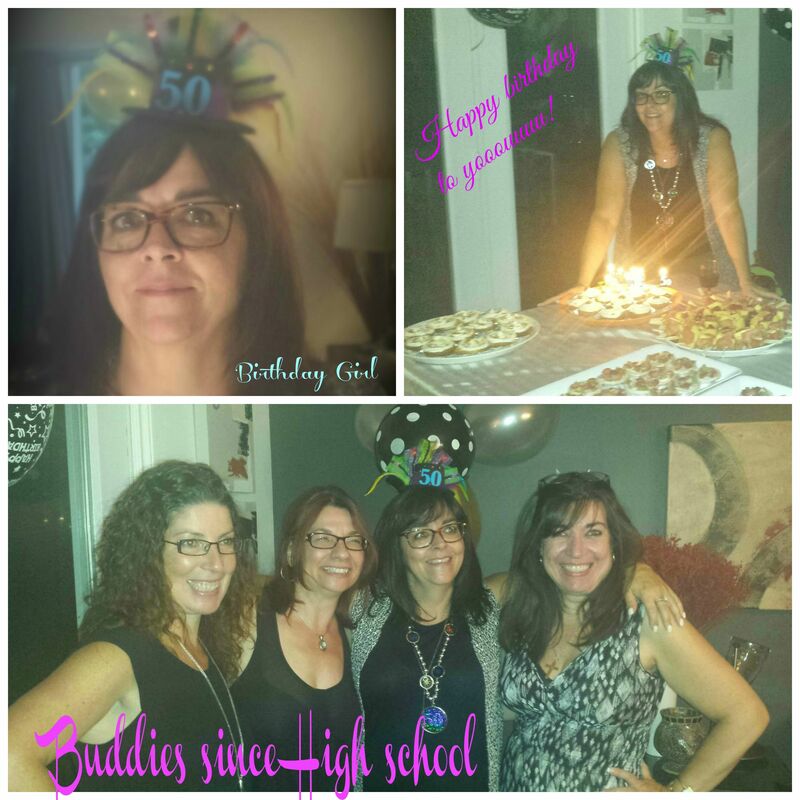 Had a great time at Tina’s surprise 50th party – yes, she was surprised – especially by some of her friends who came from afar! Had the house to myself most of the day so was able to cook in peace while watching my “chick flicks”! Really glad I decided to make those almond cupcakes with buttercream frosting and salted caramel drizzle at Emma’s suggestion. Oh my…. This entry was posted in Food, Friends, fun stuff, Gratitude and tagged Gratitude Sunday, surprise party. Bookmark the permalink. Cheers to your love for friends … and they appreciated your use of the Calorie Remover on the cupcakes. No counting calories at birthday parties! But using the Calorie Remover eliminates the need for counting! Of course…you do have a point! Next time you make them, tell your guest they don’t have to worry because you used a CRA … Calorie Removing Apparatus. … and Good Morning, Dale. Did you get the boys off to school? Well … I was going to say I’ll be there in 15 minutes, but you have work to do … and I don’t want to take you away from the tasks at hand. Sitting here, waiting…nothing to do while it’s marinating! Glad the surprise party went well. Always interesting events! The combination of cooking and humid weather sounds exhausting. It was! Definitely changing the beat this week! Chick flicks! I cannot wait until I carve out a bit of time for that. I watched I’ll See You in My Dreams last night and while a bit of a tear jerker, boy was it good. Glad you indulged! One of the best things hubby did for me was to install a TV in the kitchen. With the satellite dish, I can PVR all the chick flicks I want and watch them when I have the house to myself and when I’m cooking (or not!). Ooohh… that one is on my list of “to see”! Ooh, give me one of those cupcakes! Cupcakes and chick flicks sounds perfect, Dale. Lemme tell you… that little salted caramel drizzle on top… to die for! Cupcakes, chick flicks, glass of wine and a girlfriend… no?